Cecil Cooper is a first baseman who played for the Pawtucket Red Sox in 1971 and 1973. 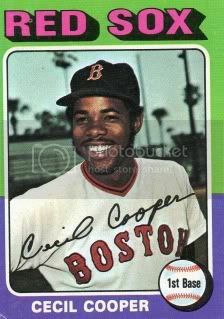 In '72, Cooper played for Louisville, which was the AAA team for Boston at the time. The next year, Pawtucket was triple-A. BAM, like that. In 1971, Cooper batted .343 through 98 games. He also hit 10 home runs. Pawtucket was an Eastern League team that season. Cooper was tied for fifth in RBIs in the International League that same season. He was tied for second in doubles and held sole possession of third place in hits. Cooper and couple of other bums have the highest all-time stolen base percentage for Pawtucket with 91.7. 1. In September of '73, Cooper played an afternoon game in Pawtucket, drove to Yankee Stadium to join Boston, and got his first at-bat in the seventh inning. 2. Cooper and couple of other bums have the highest all-time stolen base percentage for Pawtucket with 91.7. Cecil Cooper's mural is in the lobby of the first base tower.